Florida freshman Thayer Hall has been voted as the USA Today’s ALL-USA female high school athlete of the year after receiving more than 51% of the votes in an 8-player poll. Hall finished her senior season last fall at Dorman High in Roebuck, South Carolina before enrolling early for the spring semester. The USA Today High School Sports editorial staff chose 8 female athletes of the year in the 8 sports that the paper covers nationally, and then put the players to a vote for the national award. Hall received 51.03% of the fan vote, or 80,321 votes out of 157,406, to win the honor. While 51% in an a-player race sounds like it might be an overwhelming total in an 8-player race, but voting was dominated by just two athletes: Hall and Montana Fouts, a softball player from East Carter High School in Kentucky combined to pull 154,450 out of the 157,406 votes cast, or 98.12%. Hall is a 6’3″ outside hitter who was named the 2017-2018 Gatorade National Volleyball Player of the Year, the MaxPreps National Female Athlete of the Year, and PrepVolleyball’s top player in the class of 2018. She’s already been a member of 3 USA Volleyball international teams: at the 2017 FIVB U20 World Cup, the 2017 U20 Pan American Cup (where she was named MVP), and the 2016 NORCECA Championships. 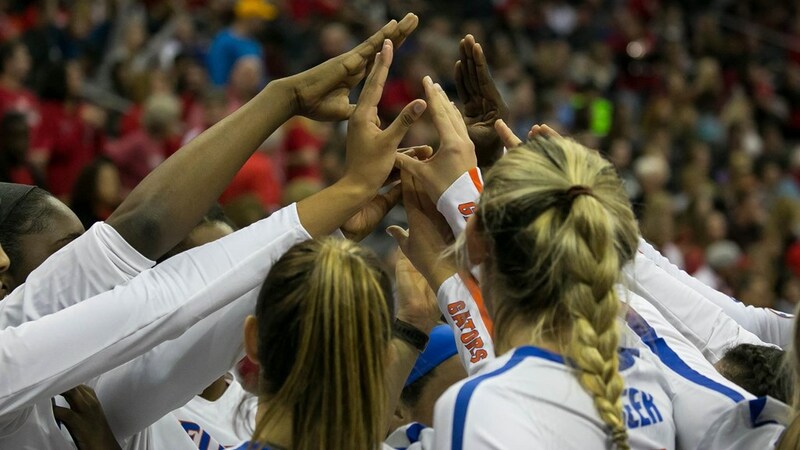 While Florida hasn’t formally announced their starting lineup yet, the Gators did graduate their top two outside hitters, Carly Snyder and Shainah Joseph, after last season. Of the remaining players, Paige Hammons is the favorite to start (she played in 115 of the Gators’ 116 sets last season as a freshman, scoring 151 points, but hit just .107), with the other spot being a battle between redshirt sophomore Mia Sokolowski (who had 65 kills in 59 sets last season, but hit just .039) and Hall. Hall is expected to grab that second starting position, especially after arriving on campus a semester early and having time to grow into the Florida system. Hall as a senior had 638 kills in 108 sets played (5.90/set) while hitting .401 (with a 51.3% kills percentage). As a 6-rotation player, she also had 204 aces in her four year high school career, 144 blocks, and 1,363 digs. She finished her high school career with 2,291 kills. Fouts, who was the youngest-ever player to commit to Alabama, is a pitcher who set a Kentucky state record as a freshman, and more as a sophomore with 14 no hitters and 9 perfect games. As a junior, she averaged 2.10 strikeouts-per-inning (barring dropped 3rd strikes, the most possible is 3 if she were to strike out every batter), and as a senior had an unnbelievable .09 ERA. She spent 7 years on East Carter’s varsity roster, beginning in 6th grade, and finished with a total ERA of .32 in her career. She also had a .566 batting average as a senior, with 12 home runs. Florida has been picked to finish 2nd in the league in the SEC pre-season coaches’ poll.